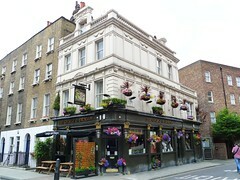 A pleasant Greene King pub to the north of Fitzrovia not too far from Great Portland Street Station. From outside, the building is festooned with colourful hanging baskets, while the inside is a traditional, simple single room with bare floorboards and comfortable tables all at one height. Music is playing on Ewan's mid-week lunchtime visit, but not loudly at all, and the environment is a pleasant one. There are three handpulls all dispensing Greene King ales, including the IPA, Bonkers Conkers and Royal London (£1.50/half) in September 2009. They also have draught lagers, including Staropramen and Amstel. Food is served noon-3:30pm Monday to Saturday, and 6pm-8:30pm Monday to Thursday. There are regular specials listed on a board in the pub and on a sheet attached to the front of the menu, but most of the menu sticks to pub classics like lasagne, burgers, sandwiches and the like. Ewan's lasagne (£6.80) was perfectly good, served with a fresh crisp salad and some fantastic slices of really garlicky garlic bread which seemed to be made on the premises. Last visited by Ewan, 30 September 2009. Food times taken from a chalkboard in the pub, September 2009. Last edited 2013-05-10 07:13:49 (version 4; diff). List all versions. Page last edited 2013-05-10 07:13:49 (version 4).